American geologist mission specialist astronaut 1978-1993. 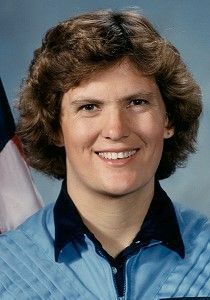 Geologist, first American woman to walk in space. As of 1999 Ms Sullivan was Director of the Center of Science and Industry in Columbus, Ohio. Status: Inactive; Active 1978-1993. Born: 1951-10-03. Spaceflights: 3 . Total time in space: 22.20 days. Birth Place: Paterson, New Jersey. Grew up in Woodland Hills, California.. Educated UCSC; Dalhousie. PERSONAL DATA: Born October 3, 1951, in Paterson, New Jersey, but considers Woodland Hills, California, to be her hometown. She enjoys flying, squash, bicycling, backpacking, and reading in her spare time. Her father, Donald P. Sullivan, resides in Cupertino, California; her mother, Barbara K. Sullivan, is deceased. EDUCATION: Graduated from Taft High School, Woodland Hills, California, in 1969; received a bachelor of science degree in Earth sciences from the University of California, Santa Cruz, in 1973, and a doctorate in geology from Dalhousie University (Halifax, Nova Scotia) in 1978. Awarded honorary degrees by Kent State University (2002); Ohio Dominican University (1998); Stevens Institute of Technology (1992); State University of New York, Utica (1991); Dalhousie University (1985). ORGANIZATIONS: Appointed a member of the National Science Board in November 2004. Served on the Pew Oceans Commission, whose nationwide study and subsequent report, "America's Living Oceans: Charting a Course for Sea Change," calls for immediate reform of U.S. ocean laws and policies to avert the decline of ocean wildlife and collapse of ocean ecosystems (2000-2003). In 2003, appointed Chair of the Ohio Aerospace and Defense Advisory Council by Ohio Governor Robert Taft. Appointed to the Chief of Naval Operations Executive Panel in 1988. In March 1985, appointed by President Reagan to the National Commission on Space. The Commission's report, entitled "Pioneering the Space Frontier," laid out goals for U.S. civilian space activities over the next 25 years. Adjunct Professor of Geology at The Ohio State University, Columbus, Ohio. Fellow of the American Association for the Advancement of Science and the American Institute of Astronautics and Aeronautics. Member of the Woods Hole Oceanographic Institution, the Explorers Club, the Society of Woman Geographers and Association of Space Explorers. SPECIAL HONORS: Aviation Week & Space Technology Aerospace Legend Award (2005); Astronaut Hall of Fame (2004); Public Service Award, National Science Board, in recognition of lifelong commitment to science education (2003); Juliette Award for National Women of Distinction, Girl Scouts USA (2002); Ohio Women's Hall of Fame (2002); Ohio Veteran's Hall of Fame (2001); Lone Sailor Award, U.S. Navy Memorial Foundation (1997); NASA Medal for Outstanding Leadership (1992); AIAA Haley Space Flight Award (1991); AAS Space Flight Achievement Award (1991); NASA Exceptional Service Medal (1988 & 1991); NASA Space Flight Medal (1984 & 1990); Ten Outstanding Young People of the World Award, Jaycees International (1987); Ten Outstanding Young Americans Award, U.S. Jaycees (1987); National Air and Space Museum Trophy, Smithsonian Institution (1985); Four Presidential nominations under four different administrations (1985, 1992, 2000, 2004). EXPERIENCE: Most of Dr. Sullivan's efforts prior to joining NASA were concentrated in academic study and research. She was an earth sciences major at the University of California, Santa Cruz and spent 1971-1972 as an exchange student at the University of Bergen, Norway. Her bachelor's degree (with honors) was awarded in 1973. Her doctoral studies at Dalhousie University included participation in a variety of oceanographic expeditions, under the auspices of the U.S. Geological Survey, Wood's Hole Oceanographic Institute and the Bedford Institute. Her research included the Mid-Atlantic Ridge, the Newfoundland Basin and fault zones off the Southern California Coast. She is a private pilot, rated in powered and glider aircraft. The first American woman to walk in space, Dr. Sullivan is a veteran of three shuttle missions and a 2004 inductee to the Astronaut Hall of Fame. In 1993, Dr. Sullivan left NASA to accept a Presidential appointment to the post of Chief Scientist at the National Oceanic and Atmospheric Administration (NOAA). Here she oversaw a wide array of research and technology programs ranging from climate and global change to satellites and marine biodiversity. From 1996 to 2006, Dr. Sullivan served as President and CEO of COSI (Center of Science & Industry) in Columbus, Ohio. Under her leadership, COSI strengthened its impact on science teaching in the classroom and its national reputation as an innovator of hands-on, inquiry-based science learning resources. Dr. Sullivan then served as the inaugural Director of the Battelle Center for Mathematics and Science Education Policy in the John Glenn School of Public Affairs at The Ohio State University. Dr. Kathryn Sullivan was confirmed by the Senate as the Under Secretary of Commerce for Oceans and Atmosphere and NOAA Administrator on March 6, 2014, having served as Acting NOAA Administrator since February 28, 2013. Prior to her appointment as Acting Administrator, Dr. Sullivan held the position of Assistant Secretary of Commerce for Environmental Observation and Prediction and Deputy Administrator. As Assistant Secretary, Dr. Sullivan played a central role in directing Administration and NOAA priority work in the areas of weather and water services, climate science and services, integrated mapping services and Earth-observing capabilities. She also provided agency-wide direction with regard to satellites, space weather, water, and ocean observations and forecasts to best serve American communities and businesses. Dr. Sullivan is the United States Co-chair of the Group on Earth Observations (GEO), an intergovernmental body that is building a Global Earth Observation System of Systems (GEOSS) to provide environmental intelligence relevant to societal needs. 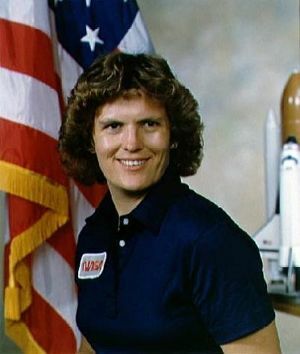 NASA EXPERIENCE: Selected by NASA in January 1978, Dr. Sullivan became an astronaut in August 1979. Her Shuttle support assignments since then include: software development; launch and landing lead chase photographer; Orbiter and cargo test, checkout and launch support at Kennedy Space Center, Florida; extravehicular activity (EVA) and spacesuit support crew for several flights; and capsule communicator (CAPCOM) in Mission Control for numerous Shuttle missions. A veteran of three space flights, Dr. Sullivan was a mission specialist on STS-41G (October 5-13, 1984), STS-31 (April 24-29, 1990) and STS-45 (March 24-April 2, 1992). Joining NASA, Dr. Sullivan's research interests were focused on remote sensing. She qualified as a systems engineer operator in NASA's WB-57F high-altitude research aircraft in 1978 and participated in several remote sensing projects in Alaska. She was a co-investigator on the Shuttle Imaging Radar-B (SIR-B) experiment, which she flew on Mission STS-41G. SPACE FLIGHT EXPERIENCE: STS-41G, launched from Kennedy Space Center, Florida, on October 5, 1984, with a crew of seven. During their eight-day mission, the crew deployed the Earth Radiation Budget Satellite, conducted scientific observations of the Earth with the OSTA-3 pallet (including the SIR-B radar, FILE, and MAPS experiments) and large format camera (LFC), conducted a satellite refueling demonstration using hydrazine fuel with the Orbital Refueling System (ORS), and conducted numerous in-cabin experiments as well as activating eight "Getaway Special" canisters. Dr. Sullivan and Commander Leestma also successfully conducted a 3-1/2 hour Extravehicular Activity (EVA) to demonstrate the feasibility of actual satellite refueling, making her the first U.S. woman to perform an EVA. STS-41G completed 132 orbits of the Earth in 197.5 hours, before landing at Kennedy Space Center, Florida, on October 13, 1984. In April 1990, Dr. Sullivan served on the crew of STS-31, which launched from Kennedy Space Center, Florida, on April 24, 1990. During this five-day mission, crew members aboard the Space Shuttle Discovery deployed the Hubble Space Telescope, and conducted a variety of middeck experiments involving the study of protein crystal growth, polymer membrane processing and the effects of weightlessness and magnetic fields on an ion arc. They also operated a variety of cameras, including both the IMAX in-cabin and cargo bay cameras, for Earth observations from their record setting altitude of 380 miles. Following 76 orbits of the Earth in 121 hours, STS-31 Discovery landed at Edwards Air Force Base, California, on April 29, 1990. Dr. Sullivan served as Payload Commander on STS-45, the first Spacelab mission dedicated to NASA's Mission to Planet Earth. During this nine-day mission, the crew operated the twelve experiments that constituted the ATLAS-1 (Atmospheric Laboratory for Applications and Science) cargo. ATLAS-1 obtained a vast array of detailed measurements of atmospheric chemical and physical properties, which will contribute significantly to improving our understanding of our climate and atmosphere. In addition, this was the first time an artificial beam of electrons was used to stimulate a man-made auroral discharge. 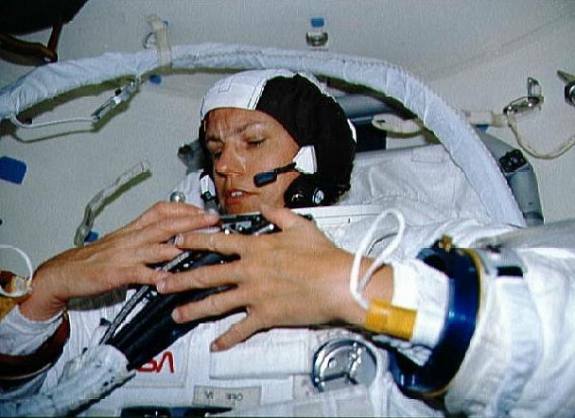 With the completion of her third mission, Dr. Sullivan logged more than 532 hours in space. BIRTHPLACE AND DATE: Born October 3, 1951, in Paterson, New Jersey, but considers Woodland Hills, California to be her hometown. Her father, Donald P. Sullivan, resides in Cupertino, California; her mother, Barbara K. Sullivan, is deceased. PHYSICAL DESCRIPTION: Brown hair; green eyes; 5 feet 6 inches; 150 pounds. EDUCATION: Graduated from Taft High School, Woodland Hills, California, in 1969; received a bachelor of science degree in Earth Sciences from the University of California, Santa Cruz, in 1973, and a doctorate in geology from Dalhousie University (Halifax, Nova Scotia) in 1978. Awarded honorary degrees by Dalhousie in 1985 and the State University of New York in 1991. RECREATIONAL INTERESTS: She enjoys flying, squash, bicycling, backpacking, and reading in her spare time. ORGANIZATIONS: Appointed to the Chief of Naval Operations Executive Panel in 1988. In March 1985, Dr. Sullivan was appointed, by President Reagan, to the National Commission on Space. The Commission's report, entitled "Pioneering the Space Frontier," laid out goals for U.S. civilian space activities over the next 25 years. She is also a member of the Geological Society of America, the American Geophysical Union, the American Institute of Aeronautics and Astronautics, the Explorers Club, the Society of Woman Geographers, and the Sierra Club. SPECIAL HONORS: NASA Exceptional Service Medal (1988); Ten Outstanding Young People of the World Award, Jaycees International (1987); Ten Outstanding Young Americans Award, U.S. Jaycees (1987); National Air and Space Museum Trophy, Smithsonian Institution (1985); NASA Space Flight Medal (1984 & 1990); AIAA Haley Apace Flight Award (1991); AAS Space Flight Achievement Award (1991). EXPERIENCE: Much of Dr. Sullivan's efforts prior to joining NASA were concentrated in academic study and research. She was an earth sciences major at the University of California, Santa Cruz, and spent 1971-1972 as an exchange student at the University of Bergen, Norway. Her bachelor's degree (with honors) was awarded in 1973. Her doctoral studies at Dalhousie University included participation in a variety of oceanographic expeditions, under the auspices of the U.S. Geological Survey, Wood's Hole Oceanographic Institute, and the Bedford Institute. Her research included the Mid-Atlantic Ridge, the Newfoundland Basin, and fault zones off the Southern California Coast. Dr. Sullivan is an oceanography officer in the U.S. Naval Reserve, currently holding the rank of lieutenant commander. In 1985, Dr. Sullivan became an Adjunct Professor of Geology at Rice University, Houston, Texas. NASA EXPERIENCE: Selected by NASA in January 1978, Dr. Sullivan became an astronaut in August 1979. Her Shuttle support assignments have included: software development; launch and landing lead chase photographer; Orbiter and cargo test, checkout and launch support at Kennedy Space Center, Florida; extravehicular activity (EVA) and spacesuit support crew for several flights; and Capsule Communicator (CAPCOM) in Mission Control for numerous Shuttle missions. A veteran of three space flights, Dr. Sullivan was a mission specialist on STS-41G (October 5-13, 1984), STS-31 (April 24-29, 1990), and STS-45 (March 24-April 2, 1992). Since joining NASA, Dr. Sullivan's research interests have focused on remote sensing. She qualified as a systems engineer operator in NASA's WB-57F high-altitude research aircraft in 1978 and has participated in several remote sensing projects in Alaska. She was a Co-Investigator on the Shuttle Imaging Radar-B (SIR-B) experiment, which she flew on Mission STS-41G. Her first mission, STS-41G, launched from Kennedy Space Center, Florida, on October 5, 1984, with a crew of seven. During their eight-day mission, the crew deployed the Earth Radiation Budget Satellite, conducted scientific observations of the earth with the OSTA-3 pallet (including the SIR-B radar, FILE, and MAPS experiments) and large format camera (LFC), conducted a satellite refueling demonstration using hydrazine fuel with the Orbital Refueling System (ORS), and conducted numerous in-cabin experiments as well as activating eight "Getaway Special" canisters. Dr. Sullivan and Commander Leestma also successfully conducted a 3-1/2 hour Extravehicular Activity (EVA) to demonstrate the feasibility of actual satellite refueling, making her the first U.S. woman to perform an EVA. STS-41G completed 132 orbits of the Earth in 197.5 hours, before landing at Kennedy Space Center, Florida, on October 13, 1984. In April 1990, Dr. Sullivan served on the crew of STS-31, which launched from Kennedy Space Center, Florida, on April 24, 1990. 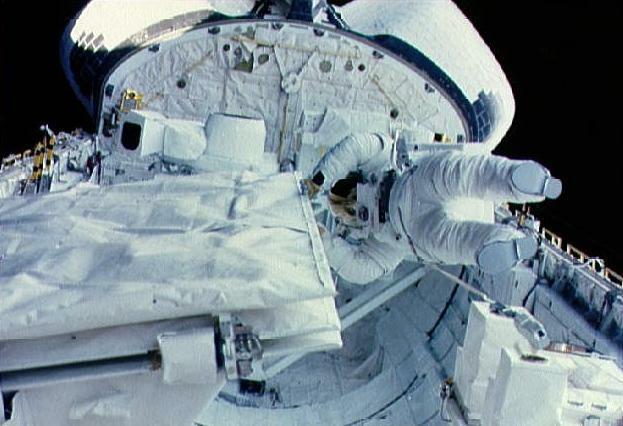 During this five-day mission, crew members aboard the Space Shuttle Discovery deployed the Hubble Space Telescope, and conducted a variety of middeck experiments involving the study of protein crystal growth, polymer membrane processing, and the effects of weightlessness and magnetic fields on an ion arc. They also operated a variety of cameras, including both the IMAX in-cabin and cargo bay cameras, for earth observations from their record setting altitude of 380 miles. Following 76 orbits of the earth in 121 hours, STS-31 Discovery landed at Edwards Air Force Base, California, on April 29, 1990. 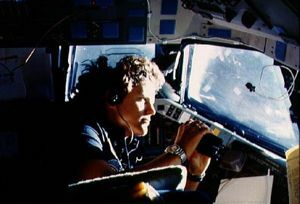 More recently, Dr. Sullivan served as Payload Commander on STS-45, the first Spacelab mission dedicated to NASA's Mission to Planet Earth. During this nine-day mission, the crew operated the twelve experiments that constituted the ATLAS-1 (Atmospheric Laboratory for Applications and Science) cargo. ATLAS-1 obtained a vast array of detailed measurements of detailed measurements of atmospheric chemical and physical properties, which will contribute significantly to improving our understanding of our climate and atmosphere. In addition, this was the first time an artificial beam of electrons was used to stimulate a man-made auroral discharge. With the completion of her third mission, Dr. Sullivan has logged 532 hours in space. Family: Astronaut. Country: USA. Flights: STS-41-G, STS-61-J, STS-31, STS-45. Projects: STS. Agency: USN. Bibliography: 12, 6077. 1951 October 3 - . Birth of Dr Kathryn Dwyer 'Kathy' Sullivan - . Nation: USA. Related Persons: Sullivan. American geologist mission specialist astronaut 1978-1993. 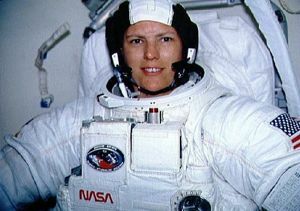 Geologist, first American woman to walk in space. As of 1999 Ms Sullivan was Director of the Center of Science and Industry in Columbus, Ohio. 3 spaceflights, 22.2 days in space. Flew to orbit on STS-41G (1984), STS-31, STS-45.